Eleven-year-old Ish Taylor is charged with protecting the NFL — and the world — from a scheming supervillain in NFL Rush Zone: Season of the Guardians. The hero is 11-year-old Ish Taylor, who lives in Canton, Ohio — conveniently home to the Pro Football Hall of Fame. Peter O'Reilly, the NFL's vice president for fan strategy and marketing, says Ish and his friends are superheroes called "guardians." "They've really been tapped to — with special powers and special responsibilities — to protect football and the world from the evil forces that are out there," O'Reilly says. Stars of the NFL show up: Drew Brees of the New Orleans Saints, DeMarcus Ware of the Dallas Cowboys and Calvin Johnson of the Detroit Lions. The NFL is a powerful brand, and Nickelodeon is clearly thrilled it was picked. A Nickelodeon press release boasts that this is the first time a major sports league has partnered with a cable network to create an original series. Keith Dawkins, a senior VP at Nickelodeon, says the two companies came together because they recognized a common goal. "They wanted to see if there was a different kind of way that they could tap into a fan base at a young age — 6, 7, 8 years old — and create these lifelong fans of the NFL. For us, [our interest is] the Nicktoons network — all animation, all the time, [a] 24-hour network really focusing on boys 6 to 11 — so that's when we realized there was a common sweet spot there," Dawkins said. Rohit Bhargava, a marketing consultant and author of the book Likeonomics, says it's "a great idea that's starting to get its legs." "The NFL is one of those few brands you can look at and say, you know what, they know what their brand and the media platform for their brand is going to look like in 10 years," he explains. "And a lot of brands don't have an answer for that." But as a parent, Bhargava says the NFL should also address the real dangers of football. "Just the safety of playing football, [given] the discussion around concussions and kids playing football. And so I think this effort to kind of involve children in the NFL, but also to think about the role for football for kids in a responsible way, is going to be a huge thing for the NFL moving forward," Bhargava says. Ish — the hero of NFL Rush Zone — plays pee-wee football, but injuries are the least of his problems. He's got 32 NFL teams to protect from evil villains with names like Wild Card and Sudden Death. On a Friday, it's MORNING EDITION from NPR News. I'm David Greene. Your favorite TV sitcom or reality show has nothing on football. Football is the biggest thing on television. Last Sunday - and this is pretty typical - the shows that came in second place had just half the ratings of the NFL games. And that large audience includes the demographic coveted by advertisers: young men. The National Football League could coast nicely on its colossal audience. But as NPR's Elizabeth Blair reports, the league is now putting its muscle into getting more children to watch. ELIZABETH BLAIR, BYLINE: When the NFL wants to make a play for a particular demographic, they go long. To attract Latinos, it forged partnerships with Univision and Telemundo. To keep women happy, it came out with a clothing line with shirts that actually fits better than those boxy jerseys. To engage children, the NFL is going where they go: Nickelodeon. 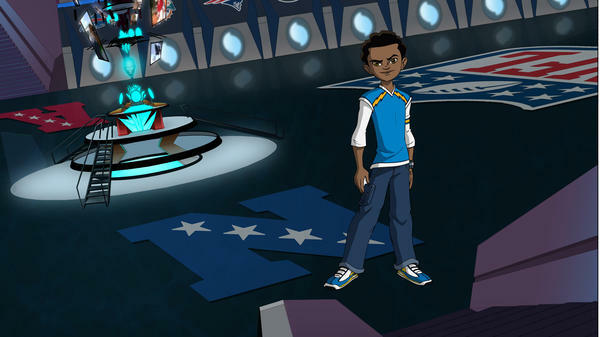 BLAIR: "NFL Rush Zone: Season of the Guardians" is a new series rolling out today, co-branded by the NFL and Nicktoons. The hero is 11-year-old Ish Taylor, who lives in Canton, Ohio, conveniently home to the Pro Football Hall of Fame. Peter O'Reilly, the NFL's vice president for Fan Strategy and Marketing, says Ish and his friends are the superheroes called guardians. PETER O'REILLY: They've really been tapped with special powers and special responsibilities to protect football and the world from an evil force that is out there. BLAIR: Stars of the NFL show up - Drew Brees of the New Orleans Saints, DeMarcus Ware of the Dallas Cowboys, and Calvin Johnson of the Detroit Lions. KEITH DAWKINS: They wanted to see if there was a different kind of way that they could tap into a fan base at a young age - six, seven, eight years old - and create these lifelong fans of the NFL. And then for us, the Nicktoons Network - all animation all the time, 24 hour network, really focusing on boys six to 11, so that's when we realized there was a common sweet spot there. ROHIT BHARGAVA: I think it's a great idea that's starting to get its legs. BLAIR: Rohit Bhargava is a marketing consultant and author of the book "Likeonomics." BHARGAVA: The NFL is one of those few brands that you can look at and say, you know what, they know what their brand and the media platform for their brand is going to look like in 10 years. And a lot of brands don't have an answer for that. BLAIR: But as a parent, Bhargava says the NFL should also address the real dangers of football. BHARGAVA: Just the safety of playing football and with the discussion around concussions and kids playing football. And so I think that this effort to kind of involve children in the NFL, but also to think about the role for football for kids in a responsible way, is going to be a huge thing for the NFL moving forward. BLAIR: Ish - the hero of "NFL Rush Zone" - plays Pee Wee football, but injuries are the least of his problems. He's got 32 NFL teams to protect from evil villains with names like Wild Card and Sudden Death. BLAIR: Elizabeth Blair, NPR News. Transcript provided by NPR, Copyright NPR.